Red Valve’s Series 44 Pressure Sensor isolates and protects instrumentation such as gauges, transmitters, and pressure switches from the process line, providing accurate, repeatable instrument measurement. The Series 44 Pressure Sensor is designed for the Food and Pharmaceutical and Biotech industries and is manufactured with FDA approved elastomers. Reliable, accurate instrument readings are often difficult or even impossible to obtain on slurry pipelines carrying tomato skins, seeds, pharmaceutical powder, beans, etc. With the Series 44 Pressure Sensor, line pressure is sensed 360° through the flexible rubber sleeve. The captive fluid is displaced through the pressure sensor body to the instrument’s Bourdon tube. 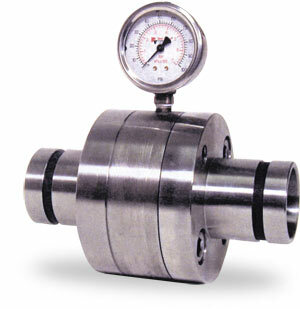 The instruments are isolated and protected from the process, assuring positive and accurate readings. With the Series 44 Food Grade Pressure Sensor the flow media is isolated by the food grade elastomer sleeve, which extends around the tri-clamp ends. This full length extension eliminates any plugging, pockets, and voids that may occur. The standard liquid fill, vegetable oil, is kept to a minimum so that the pressure reading is not affected by the temperature. Fill liquids with higher temperature ratings are available. The Series 44 Food Grade Pressure Sensor is available in sizes ¾” to 3”, and allows for easy installation and disassembly for cleaning. The Series 44 is provided with a ¼” instrument connection.